Mistakes creep into many processes. They ruin the journey to reach the goal. Same is the case with IAS preparation. 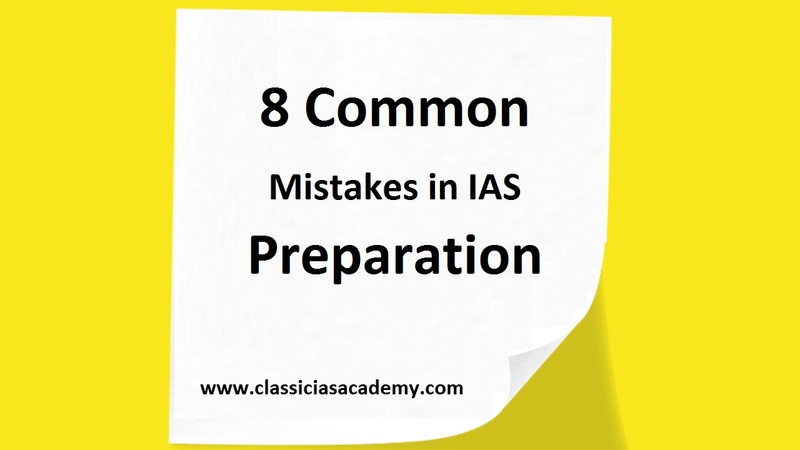 Your dream of becoming an IAS comes crashing down if mistakes are not sorted earlier. Among IAS aspirants many common mistakes prevail. These are common because they affect vast majority of the aspirants. Be attentive to these mistakes and avoid wasting precious time and energy. Sort them out at the earliest and achieve success. The world of CSE preparation is replete with rumour mongers. Falling prey to their rumours is the first mistake. Rumours over change in pattern, cut off marks, preparation strategies etc. You need to understand that you are a competitor to the rumour monger. They try to demotivate and distract you. Harden your will and pursue your goal. Your focus should solely be on the preparation and nothing else. For any information regarding the exam, always confirm through official channels. The syllabus of UPSC is already huge. Preparation needs smart work with specific inputs. But, aspirants complicate their preparation by reading from multiple sources. The information overload this process causes is harmful for your IAS dream. At the crucial moment, the brain will not be able to retrieve important information. So it is advisable to avoid this mistake of indulging in multiple sources. Smart work requires a specific set of books or other resources and revising them multiple times. It is common for a person to have self-doubt when the process of achieving the goal is long and results are far away. Somehow self-doubt creeps into the minds of ias aspirants. It disturbs the routines, creates anxiety, leads to backlog of topics to study etc. Self-doubt will have a severe impact on your performance. Note the cues and stop it before it becomes difficult to handle. Speak to your parents, friends and supporters when in doubt. Stay motivated and stay hungry. You study diverse topics for CSE. Recalling them in the right moment is important. Practicing answer writing helps you here. Not practicing is the common mistake among aspirants. Write answers daily and practice previous year question papers on a regular basis. Joining a test series might be of help. It creates a writing routine and you would not feel tense during the actual exam. Avoid this mistake and be ready for the exam. Not planning ahead is another common mistake. The mammoth syllabus and the year-long preparation process require proper planning. Without which coherence in your preparation goals will be lost. You might miss studying many topics. Often aspirants plan at a very late stage. Avoid such mistakes in your preparation process. Plan ahead and stick to the plan. You have planned thoroughly and set monthly, weekly and daily goals. But, due to procrastination you are unable to complete them. It leads to piling up of topics to be covered. It leads to stress and skipping of topics. In the end, you will go to the exam ill-prepared and ultimately fail. This mistake is often seen in many candidates. Procrastination is a hard habit to crack. If you are Preparing for Civil Services Exam CSE, then you must crack it. Find ways and take help to crack the habit. The most costly mistake aspirants make is dividing the preparation process between prelims and mains. The CSE preparation is a simultaneous process. When mains syllabus almost completely covers the prelims syllabus what is the point in dividing the preparation process? You can stop preparing for mains only a few months before prelims examination. Otherwise both need to be studied together. Only thing you need to separate is the perspective towards both the exams. CSAT in prelims has become tough. In recent years, it is the major cause for elimination of many candidates. One reason is the overconfidence of the candidates. The other is mistake #4 – not practicing. Since the paper was made a qualifying one UPSC raised the standards of the questions. Hence practice for CSAT is absolutely necessary, especially the comprehension. Students from non-engineering background must take extra care for this paper. With the number of candidates applying for CSE rising year on year, UPSC is using CSAT paper to filter serious candidates. It is time to work on the CSAT paper. You do not have to score but to qualify in CSAT which is very important aspect. One can’t ignore and skip it.